Warframe is not content to maintain the status quo. Last year’s Plains of Eidolon expansion is an excellent example of that, as Digital Extremes shifted away from the tight corridors on alien bases and spaceships and embraced an open world for the first time ever. But where that update was a huge departure from what Warframe was at the time, the upcoming Fortuna and Codename: Railjack expansions are aiming to amplify the current experience in impressive and engaging ways. 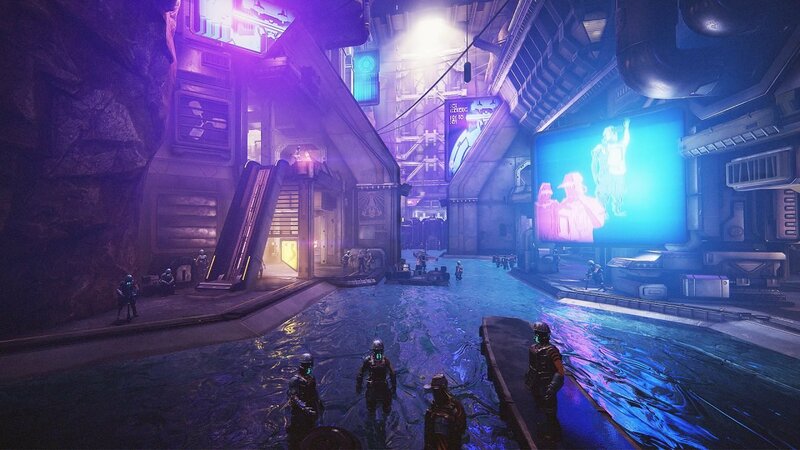 Announced at TennoCon 2018 in London, Ontario, this past weekend, the Fortuna expansion will be the first of the two updates to launch, with a planned release for later this year. Ditching the rolling hills of Earth in the current open world area, Fortuna takes the action to blue and orange tinged landscape of Orb Vallis on Venus, where giant mushrooms tower over smaller fauna and mountains stretch out into the distance. Stated to be five times as big as Plains of Eidolon, it is much more vibrant and active at first glance, and nowhere is this more apparent than the expansions central location. Contrasting the alien landscape is the Debt-Internment Colony, a cyberpunk underground city that will serve as the hub area. Inside it reside the Solaris, a new race of part-human, part-robot people that fight back against the ruling Corpus overlords in a revolution called Solaris United. Warframe Senior Producer Dave Kudirka says that the move to Venus, and the introduction of the Solaris, was a deliberate attempt to separate Fortuna from what players saw in Plains of Eidolon. If the idea of kickstarting a revolution as an outsider sounds cliche, it helps that Warframe is deliberately setting its own tone for the proceedings. Our introduction to the demo consisted of a chain gang song, with workers moving in time with the beat. The reason why the Solaris are in debt to the Corpus is due to their need to sell off parts of their own bodies so they can eke out a living. 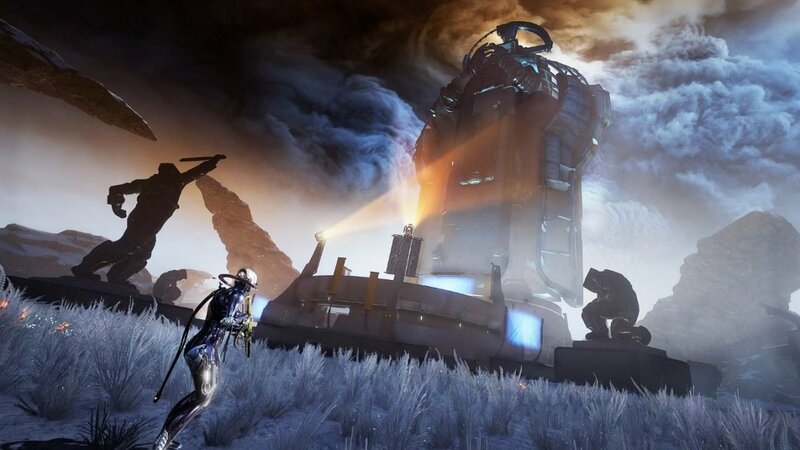 As different as the setting is, Fortuna will play out similarly to Plains of Eidolon. You’ll venture out into the world to complete bounties and farm materials, the former of which can now be turned in outside of the city (the announcement of which sparked some of the biggest cheers I heard at TennoCon). 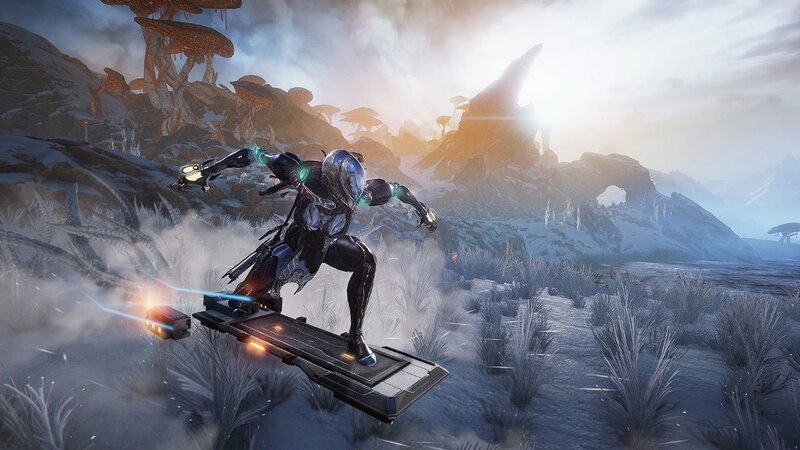 While the current go-to transportation method in Warframe are Archwings, the brand new hoverboards will allow you to travel the landscape quickly on the ground while still being able to do sweet tricks. But it’s also far more engaging than the earlier expansion. One of the new additions will also place you in the role of a conservationist, tracking down Venusian wildlife and collecting them so they don’t go extinct. To do that, you’ll have to use the appropriate lure and make the correct call in order to draw each animal out. You’ll create these noises through a mini-game, though Digital Extremes has not clarified how to actually do this. From there, it’s a waiting game as you hide and take aim with a tranquillizer rifle to bag and tag your targets. It’s weird at a glance, but it is certainly one of the most interesting additions to the game. Similarly interesting, in the creepy oh-god-why-did-they-make-this kind of way, are the brand new enemy type: Spider Bots. They are exactly what they sound like – giant spiders that are a fusion of cybernetics and flesh. They range in size from that of a small dog to a three-story building with a machine gun attached to their underbellies. When I asked Kudirka about whether there were any arachnophobes on staff, he was willing to bet that there were likely a handful. If you’re one of those reading this, bless you for conquering your fears, because I’ll be exiting stage left. But if Fortuna was the only update that Digital Extremes announced, then TennoCon attendees could have gone home perfectly satisfied, unaware of the grander vision that is being planned. Instead, the developers surprised everyone with the reveal of Railjack, a future update that will see Warframe dramatically move away from corridors and planets and into their own controllable spaceship. Up to four players can call a ship from orbit, board it, and more or less seamlessly rocket into space to engage with enemies that are holed away in their own frigates. While the demo showcased entering orbit from Venus’ surface, Kudirka was mum on the details as to where else this feature will be available. I’d imagine that Earth would be a go-to location, considering that is where the other open world area is located. But regardless as to how many planets this feature will be available to use at launch, it is an impressive feature that shifts how Warframe can be played. Dogfighting in Railjack isn’t just a straightforward affair either. While flying the ship, diverting power to the weapons and shields, and manning turrets is one of the primary methods of combat, both you and the enemy will have the ability to launch and board each other’s ships. In the demo, that meant fighting off a small Corpus raiding party before one player rocketed off to their command ship for some retribution. Fighting on the ship resembles the traditional Warframe combat we’ve come to know over the years, but it has the added twist that players who stay behind can also meaningfully contribute. Using the command module, a small map appears that shows the turrets, locked doors, and more aboard the opposing ship, which can then be activated or deactivated on command. That meant watching an energy field disappear to allow the boarding party to advance forward. When it came time to scuttle it, the player in the command module fired a torpedo that resulted in a flurry of explosions, which their ally desperately ran through to escape. It felt cinematic to witness, and though we only saw the briefest of glimpses, it was more than enough to reinvigorate my excitement for the future of Warframe. But as more and more is added to Warframe, the content hill that new players must climb is getting steeper and steeper. Talking to Kudirka, it’s clear that Digital Extremes are always looking back on the introductory experience, and may even revisit it later – though when that will happen is anyone’s guess. With these two announcements, Digital Extremes have a much longer roadmap for the future than they did before. Though Fortuna is set to launch sometime later this year, Railjack has no set date. Coupled with the brand new cinematic quest that was announced, The New War, along with two new frames for players to make use of, and there is enough content on the horizon to satisfy any fan. Warframe is a dramatically different game now than it was two years ago, and I can’t wait to see where it will be two years hence.